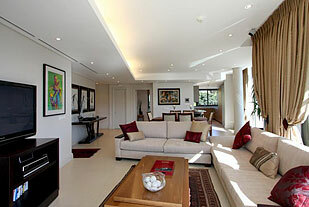 Kylemore 410 is a beautiful three bed luxury vacation rental in the V&A Marina. 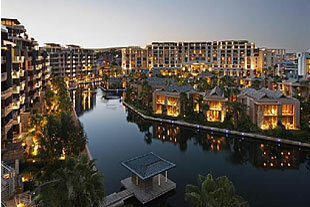 A spectacular, spacious dream, this brand new development on the canals enjoys exclusive views of the waterways and has private access to the Waterfront shopping district. Main en-suite bathroom with shower and bath. Second bathroom with shower. Third bathroom with shower. 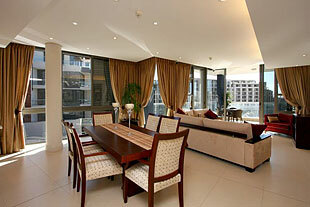 Open plan kitchen, lounge and dining area. 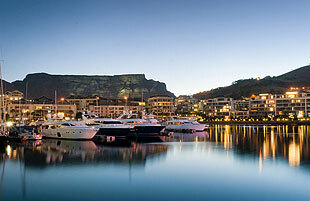 Balcony overlooking the marine waterways, city and Table Mountain. Air conditioning and Under-floor heating. 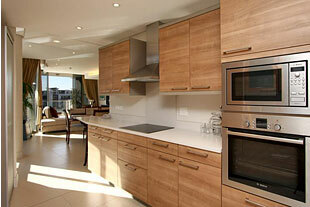 Fully equipped kitchen with Washing machine, tumble dryer, dishwasher. Telephone, Cable television/DSTV/DVD player .Housekeeping Services – Monday to Friday. 4 Communal Pools Fully Equipped gym Wireless internet access – pre-paid 24 Hour access controlled security Undercover parking with direct access to building Stylish luxury. 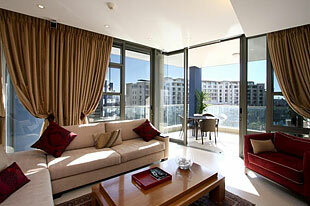 A wonderfully stylish and interesting apartment, which you are guaranteed to enjoy your stay in. Unique and original artwork and classic furniture with a modern take add to the stylish feeling of the apartment. Rich fabrics and plush finishing touches will allow you to recover from your day in comfort, or to be in equal comfort if you are staying in for the day. 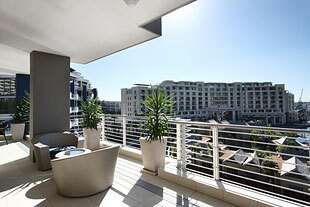 The lovely balcony offers great views of the working harbour and the whole of the Waterfront development, there is also a stunning view of Table Mountain from the apartment. walking distance. Within walking distance are also 70 restaurants and bars, 190 specialist stores as well as delicatessen, winery and supermarkets, live theatre, cinema and amphitheatre featuring music concerts, drama and dance performances.